trackscotland.co.uk :: View topic - Fuchs Titan Race - buy 5L, get 1L free! 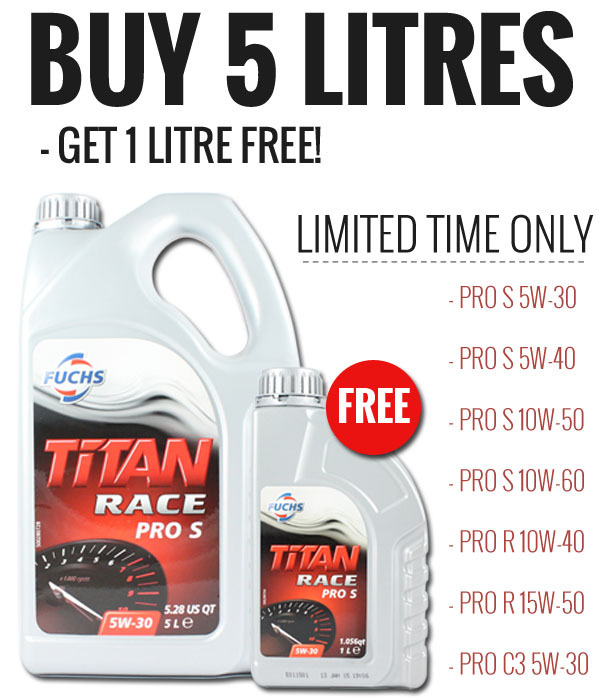 Wed Apr 20, 2016 12:55 pm Post subject: Fuchs Titan Race - buy 5L, get 1L free! You can order any number of 5 litre bottles to get the same number of 1 litre bottles absolutely free. For example, if you buy 4 x 5 litres, you will also receive 4 x 1 litres COMPLETELY FREE OF CHARGE. To receive your free litre, make sure you select the promotional 5 litres (Plus a FREE 1 litre) option that will be displayed seperately from the standard 5 litre option. The full range can be found [url=http://www.opieoils.co.uk/c-1795-fuchs-engine-oil.aspx#Filter=[EntityIDs=@%281285%29@*ava=0]HERE[/url]. This is a limited time offer, so get those orders in quick!